Socks: Too messy? Or contained and organized “enough”? I say the point of organizing is so you can find what you need when you need it. So it’s easy to put your stuff away again where it belongs. So you can save time, money, and energy, and live in a pleasantly clutter-free environment (according to your personal comfort level, or sweet spot). Making it look pretty is nice, certainly, and is more important to some than to others, but it’s a secondary goal to functionality. More organizing is more work. The trick is to organize as much as you need to… and no more. It’s true what they say: Organized people are just too lazy to look for things! It’s true what they say: Organized people are just too lazy to look for things! Here are some personal examples. Keep in mind that these systems work for me, but they might not work for you at all. It depends on how much stuff you have; how much storage space is available to you; how big your family is; and your personal goals, style, and preferences. When working with a client, my job is to find a system that will work for you, not for me. Clothing: I organize by Extremely Casual (wear at home, for exercise, or for most errands), Casual (suitable for a client appointment or outing with friends), and Business Casual (suitable for networking or other public event). I have nothing formal because I don’t need it. When the Queen invites me to tea I will go shopping! Within those categories I group tops and bottoms. That’s about it. I don’t sort by color, or sleeve length, because I don’t have enough items of clothing to warrant it. My limited wardrobe pieces all live in the same 6 ft. closet all year long — plus a couple of drawers — and I can see them all at a glance. Also, I’m the only one using that closet. I don’t have seasonal clothing other than a few shorts and tank tops for summer; I just wear more, or fewer, layers according to the weather. I do have jackets and coats in a separate hall closet which, if I had a family, would need some seasonal switching out due to space limitations. Socks: All my socks go in the sock drawer. There is nothing in the sock drawer besides socks, and there are no socks elsewhere (except the laundry). That’s organized enough for me! I only have white socks and black ones. I don’t feel the need to pair them up, much less stick them into a honeycomb sock organizer. (My poor friend, who gave me the organizer shown in the photo as a gift, never imagined that I wouldn’t put it to immediate and constant use.) 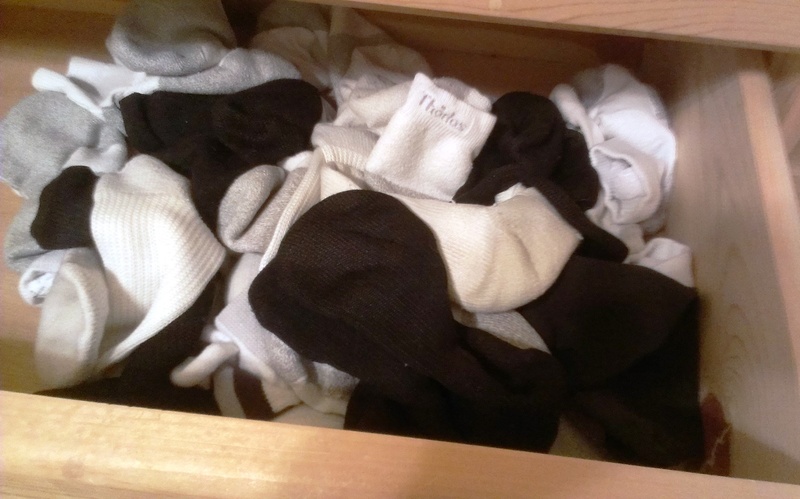 It takes me less time to choose a pair of matching loose socks in the morning than it would to fold them up and stick them in the organizer. If you have a variety of socks, or a family whose socks are co-mingled in the laundry, my system might not work for you. But it works for me. Spices: I do not alphabetize my spices! But then, I also don’t cook much, so I probably don’t have as many spices as you do, either. I keep mine in two places: Baking spices are up on a high shelf with other baking stuff because I only use them a few times per year. Savory spices are within arm’s reach of the stove. It only takes me two seconds to find the spices I want, so additional organizing isn’t going to help me find them easier. Books: I have two book cases in my home. Ten shelves altogether. I do have a few categories: Newbery Medal winners (children’s literature); books about organizing and business; books I haven’t read yet; and everything else. It really isn’t that hard to find a particular book, if you only have so many. So why organize them further? Limiting the “strangers and acquaintances” on your bookshelves will really help. Of course, the fewer things you have, the easier it is to organize them. And find them later. And put them away. And clean around them. Owning more stuff leads to taking care of more stuff; needing more elaborate organizing systems to find it; difficulty putting it back where it belongs; and more cleaning around it. Is the level of organizing that I am considering (or already maintaining) worth the trouble (time, money, and energy costs)? Will it really make it easier to find what I am looking for? Will it make it easier, or harder, to put things back where they belong when I finish using them? What did you feel inadequate about, until you read this post, because it wasn’t as organized as you thought it should be? Are you relieved to hear that simpler might be better? Or do you just think I’m a lazy slob…LOL? Please join the conversation by commenting below! Copyright 2015-2019 by Hazel Thornton, Organized For Life. Wow, I really love this post. And I chuckled over your top pic–of that honeycomb organizer–because it reminds me of a picture that keeps showing up in my Pinterest feed, with a similar organizer filled with carefully rolled and organized socks and underwear. It makes me want to scream. Why spend all that time? But I think that picture does typify a common misunderstanding of what it means to be organized, which comes from lots of blogs (not yours!) and magazines and of course PInterest. I’m with you–the goal is “organized enough.” I always tell people not to overorganize–after all, the purpose of organizing is to make your life easier, not harder. I have a different clothing system from yours, but it is also low maintenance. It involves a notable lack of folding and quite a bit of just tossing things in drawers. I do hang stuff, but on nonmatching hangers (because I don’t care about aesthetics inside my closet) that are also nonflocked (so the clothes slip on & off quickly and easily). I love this post Hazel, and yes people think my home is immaculate. I laugh and tell them no it’s not perfect but if I need to find something important and could tell you exactly where it is. Thanks, Jill! I’m glad you enjoyed it! I think many POs can probably relate. Ha! I’d say you are far from a slob, Hazel! I love how genuine and honest this post is. I think reading it will put a lot of people at ease. I am fond of the quote you referenced: “Organized people are just too lazy to look for things” as I truly believe it and I’m one of them! I hope you are right, Sarah, about putting people at ease! Or at least enabling them to change their focus from over-organizing one area to addressing other areas that need organizing. Great post Hazel! I love it. Thanks for sharing you personal “organized” areas. I feel that an organized area doesn’t have to be magazine ready (eye-candy spaces). If one writes labels with masking tape or just writes on bins the contents name, that works for me. Why make more work for oneself if the system works? The questions for over-organizing is great as well. Thanks for sharing. Ha! I sometimes think (and say) that the only tools I really need to do my job are Post-its, masking tape, and a black Sharpie! I love this post Hazel! My clients (and friends and family) think my house must look like an organizing magazine photo shoot, but I love telling them some of the ways I don’t over-organize… like my underwear… it’s just tossed in a drawer. No fancy organizers there. I love that phrase “organized enough”… that’s really what’s important. Thanks, Hilda! I like “organized enough” enough to have just changed the title of my post! I never thought of not pairing up my socks! I now fold them rather than rolling them together, but when I see your photo, I realize how easy it is just to grab the two that match when you need them. Are you gonna try it? The fewer types and colors of socks you have, of course, the easier. I haven’t tried it yet, and I actually have lots of different ones, but it should be easy to spot the matches, shouldn’t it? Thanks, Carol! It’s true….I don’t have any blue/navy socks! I do have black socks in two different weights (thin, thick), and two different styles of white socks that are easy to tell apart. Organizing spaces is sort of a “stress reliever” for me, so I probably get close to over-organized. But as long as I don’t inflict that on everyone else in the space, it seems to be okay. I don’t shoot for perfect either — I don’t think there is such a thing! Now that you mention it, Seana, I think stress might be the whole point! It doesn’t matter how organized any of us is, really, compared to each other. It matters if we can find things, and get stuff done, without stressing out, can relax in our living and working spaces, and can finish projects without worrying that they’re not perfect. If someone isn’t stressed out about their clutter, they don’t need to hire a professional organizer to help them! And if you organize to a greater degree than I do, that’s fine! So, “over-organized” is just more organized than one needs to be in order to find one’s balance between stressed and relaxed. Yes? Interesting how we feel about socks. 😉 I match up my socks and then they all get thrown in a basket. It’s an open basket so it’s easy for me to reach in and grab a pair from the top. I actually have two baskets — one for each of the two main colors of socks that I wear. It’s a simple system that’s easy for me to keep up with. Hi Deb! That’s the main thing, isn’t it? The simpler your system is, the easier it is to keep doing! Just this past year, I stopped over-organizing my socks drawer and my underwear drawer. I have a few different types of socks, so they’re matched up, but loosely thrown into the drawer. I used to fold and organize my underwear by type and in rainbow order, but now they’re just all ajumble in their home drawer and it’s surprising to me how peaceful that pile is. Well, I have to admit that while visiting Hazel at Christmas I organized all of her Newbery books in the order in which they were published. And she let me. What a good and indulgent friend! As usual, your sense of humor and honesty is terrific! I’m amazed by how much interest “sock” organizing got. People seem quite passionate and particular about their sock organizing preferences. I’m a matcher and folder. My socks are lined up in color groups in a dedicated sock drawer. And why? Because it just makes me happy when I open that drawer. But that’s me. It’s not the only way, it’s just one way. Coming from an art/design background, for me, it helps when things function, but also are visually pleasing. But as you said, that isn’t important to everyone. So understanding that is key. This is great and so true! We, as Organizers do not always have it all together. I know, so shocking. We are busy people helping others. I have to say I do have a sock organizer like the one in the photo. The thing with me in my home is that I never really wash my floors or do windows. Maybe, someday I will need to hire someone. Such a great article, and it was fun to read back over older comments and find one of my own! Another aspect of organizing for me is ROI, or “return on investment.” In this case, the investment is time instead of money. Will I get ROI from spending the time to fold my underwear instead of just throwing it in a drawer? No, not even a little bit. Will I get ROI from alphabetizing my (many) spices because I like to cook, so that I can find the one I’m looking for? Absolutely 100% yes.